Đà Nẵng ( listen) is one of the major port cities in Vietnam (in addition to Ho Chi Minh City and Haiphong) and the biggest city on the South Central Coast of Vietnam; the city is situated on the coast of the South China Sea, at the opening end of the Hàn River. Đà Nẵng is the commercial and educational center of Central Vietnam, with a well-sheltered, easily accessible port; its location on the path of National Route 1A and the North–South Railway makes it a hub for transportation. It is located within 100 km of several UNESCO World Heritage Sites, including the Imperial City of Huế, the Old Town of Hội An, and the Mỹ Sơn ruins. The city was previously known as Cửa Hàn during earlyĐại Việt settlement, and as Tourane (or Turon) during French colonial rule. 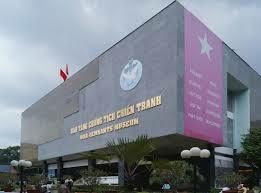 It is the third biggest economic center in Vietnam (after Ho Chi Minh City and Hanoi). Before 1997, the city was part of Quảng Nam-Đà Nẵng Province. On 1 January 1997, Đà Nẵng was separated fromQuảng Nam Province to become one of five independent (centrally controlled) municipalities in Vietnam. Đà Nẵng is listed as a first class city, and has a higher urbanization ratio than any of Vietnam’s other provinces or centrally governed cities. In terms of urban population, Đà Nẵng is the fifth largest city in Vietnam. Most of the names by which Đà Nẵng has been known make reference to its position at the Hàn River estuary. The city’s present name is generally agreed to be a Vietnamese adaptation of the Cham word da nak, which is translated as “opening of a large river”. 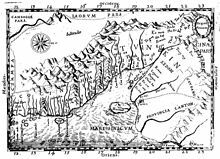 Map of Annam drafted by Alexandre de Rhodes. “Cua han” appears along the coast (upside-down, left of centre). Other Chamic sources, with similar definitions, have been proposed. Inrasara (aka Phú Trạm), a researcher specializing in Champa, suggests Đà Nẵng is a variation of the Cham word daknan (lit. “the large water”); Sakaya (aka Văn Món), another Champa researcher, claims a connection with the Raglai worddanang, meaning “river source”. 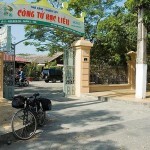 Another name given to Đà Nẵng was Cửa Hàn (lit. “mouth of the Han [river]”). The name used by the French, Tourane, is said to derive from this name, by way of a rough transliteration. Notably, this name (spelled “Cua han”) appears on maps of the area drafted byAlexandre de Rhodes in 1650. The name Kean (cf. Kẻ Hàn, roughly “Han market”) was another name purportedly used during the 17th century to refer to the land situated at the foot of the Hải Vân Pass. The Chinese name, 峴港 (Vietnamese: Hiện Cảng), translates to either “port having many mussels” or “port by a small but dangerous mountain”. The latter interpretation is taken as a reference to nearby Sơn Trà Mountain. Trà Úc, Trà Áo, Trà Sơn and Đồng Long Loan, literary names used by Confucian scholars. In Sino-Vietnamese script, used until 1945, “Đà Nẵng” is written as 沱灢. Thái Phiên, a name used briefly after the 1945 August Revolution, commemorating Thái Phiên, the leader of popular revolts during the 1916 Duy Tân Resistance. The city’s origins date back to the ancient Champa Kingdom, established in 192 AD. At its peak, the Chams’ sphere of influence stretched from Huế to Vũng Tàu. The city of Indrapura, at the site of the modern village of Dong Duong in Quảng Nam Province (about 50 km (31 mi) from Da Nang), was the capital of Champa from about 875 to about 1000 AD. Also in the region of Da Nang were the ancient Cham city of Singhapura (“City of the Lion”), the location of which has been identified with an archeological site in the modern village of Trà Kiệu, and the valley of Mỹ Sơn, where a number of ruined temples and towers can still be viewed. In the latter half of the 10th century, the kings of Indrapura came into conflict with the Đại Việt, who were then based at Hoa Lư near modern Hanoi. In 982, three ambassadors sent to Champa by King Lê Hoàn of the Đại Việt (founder of the Early Lê Dynasty) were detained in Indrapura. Lê Hoàn decided to go on the offensive, sacking Indrapura and killing the Cham King Parameshvaravarman I. As a result of these setbacks, the Cham eventually abandoned Indrapura around 1000 AD.The Đại Việt campaign against Champa continued into the late 11th century, when the Cham were forced to cede their three northern provinces to the rulers of theLý Dynasty. Soon afterwards, Vietnamese peasants began moving into the untilled former Cham lands, turning them into rice fields and moving relentlessly southward, delta by delta, along the narrow coastal plain. The southward expansion of Đại Việt (known as Nam Tiến) continued for several centuries, culminating in the annexation of most of the Cham territories by the end of the 15th century. One of the first Europeans to visit Đà Nẵng was Portuguese explorer António de Faria, who anchored in Đà Nẵng in 1535. Faria was one of the first Westerners to write about the area and, through his influence, Portuguese ships began to call regularly at Hội An, which was then a much more important port than Đà Nẵng.Throughout the 17th and 18th centuries, French and Spanish traders and missionaries regularly made landfall at Hội An, just south of Đà Nẵng. An American, John White, arrived at Da Nang (then called Turon) on 18 June 1819 in the brig Franklin of Salem, Massachusetts, and was advised that the country was recovering from devastating wars, and that what little produce there was had already been promised. Other American ships arriving shortly after were the Marmion of Boston, and theAurora and Beverly of Salem. Conditions were such that they were unable to conduct trade, and the subsequent missions of British East India Company agentJohn Crawfurd in 1823 and the two missions of Andrew Jackson’s agent, diplomatist Edmund Roberts, in 1833 and 1836 were unable to secure trade agreements. :pp.19–40 Following the edict of Emperor Minh Mạng in 1835, prohibiting European vessels from making landfall or pursuing trade except at Hàn Port, Đà Nẵng quickly surpassed Hội An, becoming the largest commercial port in the central region. French forces capture Đà Nẵng, 1858. In 1847, French vessels dispatched by Admiral Cécille bombarded Đà Nẵng, ostensibly on the grounds of alleged persecution of Roman Catholic missionaries. In August 1858, once again ostensibly on the grounds of religious persecution, French troops, led by Admiral Charles Rigault de Genouilly, and under the orders of Napoleon III, landed in Đà Nẵng as part of the punitive Cochinchina Campaign. The French overpowered the Vietnamese stationed in Đà Nẵng, swiftly occupying the city and Tiên Sa peninsula (present-day Sơn Trà peninsula). Despite their initial success, the occupying forces were quicklyplaced under siege by the Vietnamese army under the command of Nguyễn Tri Phương, and were eventually forced to retreat in March 1860. Conversely, however, the French were able to capture the southern stronghold of Saigon and, in June 1862, several provinces of southern Vietnam were ceded to the French as Cochinchina with the signing of the Treaty of Saigon. Through two more decades of conflict, the French gradually strengthened their hold on Vietnam, culminating in the establishment of French Indochina (French: Union de l’Indochine Française) in October 1887. Two years later, in 1889, the French colonists renamed the city Tourane, placing it under the control of the Governor General of Indochina. It came to be considered one of Indochina’s five major cities, among Hanoi, Saigon–Cholon, Hải Phòng, and Huế. During the Vietnam War, the city was home to a major air base that was used by both the South Vietnamese and United States air forces. The base was considered one of the world’s busiest airports during the war, reaching an average of 2,595 air traffic operations daily, more than any airport in the world at that time. The final U.S. ground combat operations in Vietnam ceased on 13 August 1972, when a residual force of the 196th Light Infantry Brigade stood down in Đà Nẵng. B Battery 3rd Battalion, 82nd Field Artillery Regiment fired the final U.S. artillery round and the 3rd Battalion, 21st Infantry Regiment finished their final patrols. This residual force was known as “Operation Gimlet”. 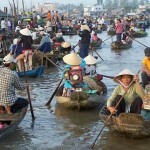 Đà Nẵng is the largest city in central Vietnam and one of the country’s most important ports. 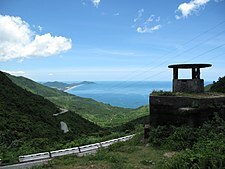 Ringed by mountains on one side and the South China Sea on the other, Đà Nẵng borders Thừa Thiên–Huế Province across the Hải Vân Pass to the north,Quảng Nam Province to the south and west, and the ocean to the east. It is 759 km (472 mi) south of Hanoi, and 960 km (600 mi) north of Hồ Chí Minh City. Geologically, Đà Nẵng is situated at the edge of a Paleozoic fold belt known as the Truong Son Orogenic Zone, whose main deformation occurred during the early Carboniferous period. Đà Nẵng’s topography is dominated by the steep Annamite mountain range to the north and northwest, featuring peaks ranging from 700 to 1,500 metres (2,300 to 4,900 ft) in height, and low-lying coastal plains with some salting to the south and east, with several white sand beaches along the coast. Đà Nẵng has a tropical monsoon climate with two seasons: a typhoon & wet season lasting from September through March and a dry season lasting from April through August. Temperatures are typically high, with an annual average of 25.9 °C (78.6 °F). Temperatures are highest between June and August (averaging 33 to 34 °C (91 to 93 °F)), and lowest between December and February (averaging 18 to 19 °C (64 to 66 °F)). Cold, wet and windy in winter, bringing even lower temperatures in December and January. The annual average for humidity is 80.6%, with highs between October and December (reaching 84%) and lows between June and July (reaching 74–75%). On average, Đà Nẵng receives 2,505 mm (98.6 in) of rainfall. Rainfall is typically highest between October and November (ranging from 550 to 1,000 mm (22 to 39 in)) and lowest between January and April (ranging from 23 to 40 mm (0.91 to 1.57 in)). Đà Nẵng receives an average of 2156 hours of sunlight annually, with highs between 234 and 277 hours per month in May and June and lows between 69 and 165 hours per month in November and December. Widespread flooding in Đà Nẵng in the wake of Typhoon Ketsana. Đà Nẵng is susceptible to damage from typhoons that cross into the South China Sea. In 2006, the landfall of Typhoon Xangsane near the city of Huế caused 26 deaths in Đà Nẵng, damaging and destroying homes, downing trees and power lines and flooding major streets. Authorities in Đà Nẵng estimated the damage caused by Xangsane at around US$ 200 million, with more than 5,000 houses washed away, 166,000 homes damaged and 19 boats sunk. Three years later, Typhoon Ketsana made its landfall about 37 miles (60 km) south of Đà Nẵng, again causing widespread flooding. Ketsana left eight people dead and 96 injured in Đà Nẵng, and caused an estimated VND 495 billion (US$25 million) in damage. Shortly after the 2011 Tōhoku earthquake, which triggered a powerful tsunami, the People’s Committee of Đà Nẵng approved the installation of 10 early tsunami warning stations throughout the city, the first of their kind in Vietnam. Officials expected the stations would provide at least thirty minutes of warning in case of a tsunami. According to Le Huy Minh, Director of the Earthquake and Tsunami Warning Centre at the Vietnam Institute of Geophysics, a powerful earthquake (≥8 MW) in the waters north of the Philippines could pose a significant danger to the Vietnamese coastline, particularly the area around Đà Nẵng. Schoolchildren in Đà Nẵng (2007). Đà Nẵng is the fifth most populated city in Vietnam, with an area of 1,255.53 km² and a population of 951,700 as of 2011.Women make up 50.7% of Đà Nẵng’s population. Đà Nẵng’s population has been growing at rates of between 2.5% and 3% during most of the years between 2005 and 2011, significantly exceeding the national average of 1% to 1.2%. The growth rate briefly rose to 3.6% in 2010 before returning to its long-term trend with 2.68% in 2011. This is the third fastest growth rate in the country after the two southern manufacturing centers Bình Dương Province (4.41%) and Đồng Nai Province (3.5%). Đà Nẵng’s population is estimated to reach one million inhabitants by 2014. Migration has been the dominant factor in the city’s population growth at least since 2009, contributing 1.6% to 2.7% (2010) between 2009 and 2011. Out-migration has been relatively high in 2011 at 0.79% compared to 0.34% and 0.55% in previous years, while the in-migration rate has been exceeding 2% since 2009 and was at 2.28% in 2011. Đà Nẵng’s natural population growth is only slightly higher than the national average. Its crude birth rate was recorded at 18 live births per 1000 persons; the crude death rate was measured at 6.7 per 1000 persons in 2011. Life expectancy at birth was estimated at 77.4 years for women and 72.4 years for men, or 74.8 years overall in the 2009 population census. The infant mortality rate was measured at 9.9 infant deaths per 1000 live births, less than two points above the nation’s average for urban areas. The city has the highest urbanization ratio among provinces and municipalities in Vietnam, containing only 11 rural communes, the fewest of any province-level unit in Vietnam. As of 2009, 86.9% of Đà Nẵng’s population lived in urban areas; average annual urban population growth was 3.5%. The city is divided into seven mainland districts and one island district: Cẩm Lệ, Hải Châu, Hòa Vang, Liên Chiểu, Ngũ Hành Sơn, Sơn Trà, Thanh Khê, and Hoàng Sa (Paracel Islands). Before 1997, the city was part of Quảng Nam–Đà Nẵng province. On 1 January 1997, Đà Nẵng was separated from Quảng Nam Province to become one of five independent (centrally controlled) municipalities in Vietnam. Đà Nẵng led the Provincial Competitiveness Index rankings in 2008, 2009, and 2010 (and was second after Bình Dương Province in the three years before that), benefiting mostly from good infrastructure, good performance in labour training, transparency, proactive provincial leadership and low entry costs. Exports increased to 575 million US$ in 2008, but fell back to 475 million US$ in 2009. Despite its status as a city, 37,800 people in Đà Nẵng were employed in agriculture, forestry and fishing as of 2007, producing 45,000t of rice and 41,000t of fish.However, employment in these sectors had a clear negative trend in the first decade of the 21st century. Gross output has also been decreasing during the second half of the decade. 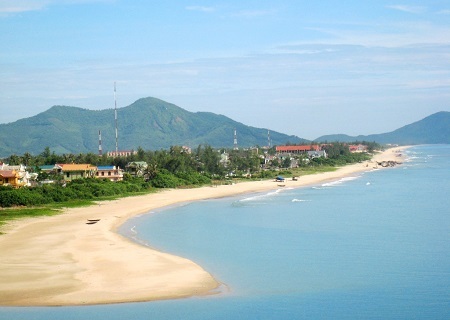 Given Đà Nẵng’s lack of agricultural land (9200ha as of 2007) and its location at the coast, fishing has been contributing more to the economy than agriculture, with a gross output more than twice that of agriculture. Đà Nẵng is a diversified industrial center, including industries such as machinery, electrics, chemicals, shipbuilding, and textiles. Specific industrial products include aquatic products, fabric, clothes, bricks, fertilizer, cement, soap, paper, and medical tablets. The city’s industry may diversify further. EADS is planning to set up an industrial park focused on the aviation industry in Đà Nẵng. As of 2007, Đà Nẵng industry was dominated by the state sector, which made up 57% of gross output. This is about the same as its share in 2000. Interestingly, over 80% of the state industry is centrally managed (in other words: belongs to state corporations headquartered in Hanoi). Almost half of the rest is contributed by the foreign-invested sector, while the private domestic sector is still relatively small and has not been able to significantly increase its share compared to the state sector. Industry grew by an average 14.8% per year from 2000 to 2007, making it the main engine of economic growth. However, it has the second lowest industrial growth rate in the South Central Coast (behind only Khánh Hòa Province). Employment has grown at an average 5.75%, reaching 118,900 in 2007. Historically, Đà Nẵng’s main marketplace has been the Hàn Market (Vietnamese: Chợ Hàn), which is located downtown near the western bank of the Hàn River, between Tran Phu and Bạch Đằng streets. This market, much like Bến Thành Market in Saigon, offers a wide variety of goods sold by many different vendors, such as clothing, silk, jewelry, flowers, foodstuffs such as dried fruit and fish, as well as coffee, tea and wine (including Vietnamese snake wine), etc. 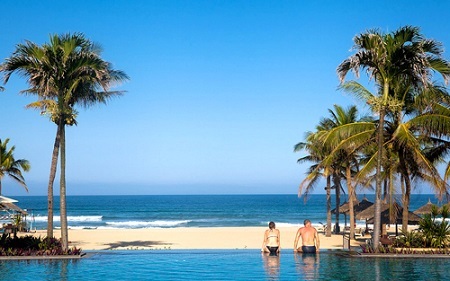 Many new construction projects are underway in Đà Nẵng, including several beachfront resorts such as the US$130 million Hyatt Regency Danang Resort & Spa, and the Beach Resort complex (including Ocean Villas and Marriott Hotel) in Ngũ Hành Sơn. Another ambitious project, the US$250 million Da Phuoc International New Town aims to construct an entirely new urban area on reclaimed land on the city’s north sea coast, making it the first major land reclamation project in Central Vietnam. Plans for the Đa Phước project include the erection of a hotel and several smaller resorts, a 33-story apartment block and 60-story office block, an 18-hole golf course, a marina, as well as villas and international schools. Gateway leading to Huyen Khong Cave in the Marble Mountains. The tourism sector is a vital component of Da Nang’s economy. Its status as a transportation hub for Central Vietnam and its proximity to several UNESCO World Heritage Sites, including the Imperial City of Huế, the Old Town of Hội An, and the Mỹ Sơn ruins fuels much of its tourist activity. Mỹ Sơn is an archaeological site dating back more than a thousand years, in Quảng Nam. Located in a remote forested valley some 70 km west of Đà Nẵng, this former capital and religious center of the Champa kingdom once contained in excess of 70 style temples and stupas. Although badly damaged by bombing raids in the 1960s, the site still has more than 20 structures and was declared a UNESCO World Heritage Site in 1999. Many statues, sculptures and reliefs recovered from Mỹ Sơn are kept in the Museum of Cham Sculpture, near the Hàn River in the heart of Đà Nẵng. Dating from the fourth to the 14th centuries, the sensual artwork on these works depicts daily activities as well as Hindu and Buddhist religious themes. The Marble Mountains are rocky limestone outcrops jutting out of the beach just south of Đà Nẵng. Paths lead to the top of the forested cliffs, affording spectacular views of Non Nuoc Beach and the South China Sea. The caves nestled in the cliffs were originally inhabited by the Cham people. Later, the Nguyễn Dynasty built numerous pagodas among the caves. The Marble Mountains are home to various artisans producing sculpture and artwork at its base at Non Nước Village. 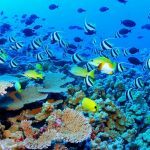 Non Nuoc Beach is a white sandy beach on the outskirts of Đà Nẵng is renowned for both its spectacular beauty and for its history as an R&R destination for American troops during the Vietnam War, when it was known as “China Beach”. Today, the beach, along with My Khê beach to the north, are home to expensive resorts, surfing and entertainment facilities. Bà Nà Hills is a mountain resort with a 5 km-long cable car system which carries guests up to Bà Nà’s peak at 1487m above sea level. Sơn Trà Mountain, just some miles away from downtown with some wild streams and resorts along the seaside. The Central Vietnamese cuisine in general and Da Nang cuisine in particular are not only well known in the country but also all over the world. This is the region where you can find the strongest and boldest flavor foods available in Vietnam such as Mì Quảng, Bún chả cá (Fish ball noodle soup), Bún mắm, Cánh gà chiên mắm (Fried chicken wings in fish sauce), Mít trộn (a salad mixed with jack-fruit and pork rind). For the ones who want to travel through the culinary rich regions of South East Asia (from Tonkin, Annam and Cochinchine, through Cambodia, Laos and finishing in Thailand), Café Indochine offers a variety of dishes, ranging from the steaming and smoking street foods to the elaborate dishes once served to the Royals’ of these great Territories such as Crispy Frogs Legs, marinated and served with crispy shallots, Annan’s rice (peppered) and an assortment of chilli dips. Concerning seafood addicts, the street Pham Van Dong along My Khe beach is the right address to discover delicious seafood dishes (Mực chiên nước mắm, Lẩu hải sản, Ốc hút (made from shellfish with papaya salad) with local prices. At night is a seafood dinner buffet every night at the Café Indochine. Besides local food, Da Nang also offers other kinds of food from different regions (Northern region, Southern region, Coastal region) and countries (France, Italy, Korea, Japan, Thai). To experience the spirit of the Northern Italian landscapes and the hillside architecture of a traditional trattoria, Don Cipriani’s Italian Restaurant is a “must”. If you prefer a romantic place overlooking the white sands of the beach, Ocean Terrace provides a peaceful, poolside setting for al fresco dining with a Mediterranean-inspired menu, offering garden fresh salads, Italian appetizers, delicious pastas, and crisp pizzas and Italian breads baked in wood-fired ovens. In June 2013, the Beach Steakhouse “The Fan” at the Furama Resort Danang beach opened its doors to welcome fans of steak and other meats. This restaurant introduces many choices of grillades, focused on true steak and meat tastes from Australia, New Zealand and the US including cuts of sirloins, rib-eye, strip loin, T-bone, ribs, lamb and fresh seafood, served with a great variety of sauces such as béarnaise sauce, mushroom sauce, red wine sauce, blue cheese sauce, pepper, mustard and onion sauce. Đà Nẵng’s football club, SHB Đà Nẵng F.C., plays in the V-League, Vietnam’s top professional football league. They are currently one of the most highly ranked teams in that league, having emerged from competition as champions of the 2009 V-League. In the same year, they were also champions at the Vietnamese Cupplayoffs. They also qualified for the 2010 AFC Champions League and the 2010 AFC Cup; although they did not advance past the qualifying play-off in the Champions League, they advanced to the quarter-finals of the AFC Cup after defeating Becamex Bình Dương in extra time. Several Đà Nẵng F.C. players also play on Vietnam’s national football team, including defender Võ Hoàng Quảng and midfielder Phan Thanh Hưng. SHB Đà Nẵng F.C. plays its home games at the Chi Lăng Stadium, a 30,000-seat stadium in Hải Châu District. There are several universities located in Đà Nẵng, with campuses in many locations throughout the city, as well as satellite campuses in surrounding regions. Acute Respiratory Distress Syndrome (ARDS) is also known as “Da Nang lung” as many cases occurring during the Vietnam War were treated at a medical centre in Đà Nẵng. A Vietnam Airlines jet is boarded in front of Da Nang Airport’s new international terminal. Đà Nẵng is on the end of the East–West Economic Corridor (EWEC) which stretches over Vietnam, Laos, Thailand, andBurma (Myanmar). Đà Nẵng International Airport, located at the center of the city, is the third largest international airport in Vietnam. It is an important gateway to access central Vietnam. The airport was known as Đà Nẵng Air Base during the Vietnam War, during which time it was described as the world’s busiest airport. During the month of May 1968, the base reached an average of 2,595 air traffic operations daily, more than any airport in the world. As of June 2011, the airport has domestic connections to Hanoi, Hồ Chí Minh City, Hải Phòng, Buôn Ma Thuột, Đà Lạt, Nha Trang, and Pleiku, as well as international connections to Guangzhou (China), Siem Reap (Cambodia), Singapore, and Taipei (Taiwan). Beginning 16 December 2011, a Malaysian low-cost carrier- Air Asia, began offering four flights a week between Đà Nẵng and Kuala Lumpur. A new international terminal opened in December 2011 and which is expected to allow further connections to destinations such as Phnom Penh (Cambodia), Thailand, Hong Kong, Japan, and South Korea. Đà Nẵng is a major station along the North–South Railway, also known as the Reunification Express. National Highways 1Aand 14B run through the city, providing road connections to Hanoi in the north and Hồ Chí Minh City in the south, as well as the Central Highlands and Laos to the west. 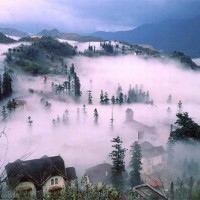 The Hải Vân Pass is a mountain pass separating Đà Nẵng and Thừa Thiên–Huế Province, where Highway 1A road passes through. To cut down on transit time and the danger to motorists from navigating the twisting mountain road, the Hải Vân Tunnel was built, opening in 2005. It is the longest tunnel in Southeast Asia at 6.28 km, and allows motorists to save between 30 minutes and an hour on traveling times over the old Hải Vân Pass route. An expressway between Đà Nẵng and nearby Quảng Ngãi is also in the planning stages. Several bridges cross the Han River and its tributaries in Đà Nẵng, including the iconic Han River Bridge, Trần Thị Lý Bridge,Nguyễn Văn Trỗi Bridge, Tuyen Son Bridge and the recently completed Thuận Phước Bridge, which is the longest suspension bridge in Vietnam. 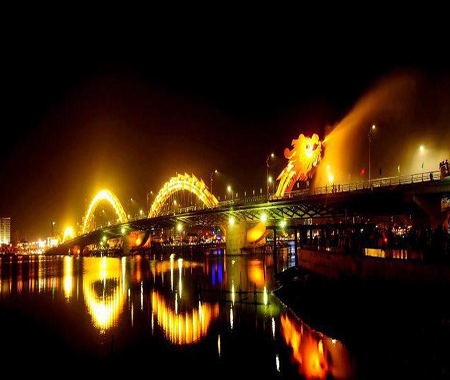 The Dragon River Bridge will cross the Han River at the Le Dinh Duong/Bạch Đằng roundabout, offering tourists coming from Đà Nẵng International Airport a more direct route to Mỹ Khế and Non Nuoc beaches, along the city’s eastern edge. The Legend of the Seas calls at Da Nang Port in February 2009. Đà Nẵng’s port system is the third largest in Vietnam after Hồ Chí Minh City and Hải Phòng. In 2008, Đà Nẵng’s port handled 2.7 million tons of cargo, of which 1.2 million tons were exports, 525,900 tons were imports, and 985,600 tons were domestic cargo. Over 29,600 passengers passed through the port in 2008, a significant increase over previous years. The port system consists of two areas: Tiên Sa Seaport, and Song Hàn Terminal. Tiên Sa Seaport has a navigation depth of 11m, and is able to receive medium range tankers of up to 45,000 DWT, as well as container ships and large cruise ships. The approach to Song Hàn Terminal is 12 nautical miles (22 km) long with a navigation depth of 6-7m, and can accommodate vessels of up to 5,000 DWT. Vietnam National Shipping Lines (Vinalines) is the port authority for Đà Nẵng’s port system. Despite the fact that the port’s infrastructure is not specifically designed to accommodate cruise ships, the number of large cruise ships docking at Đà Nẵng Port has increased in recent years. In the first two months of 2010 alone, 12 cruise ships docked in Đà Nẵng, carrying 6,477 passengers.